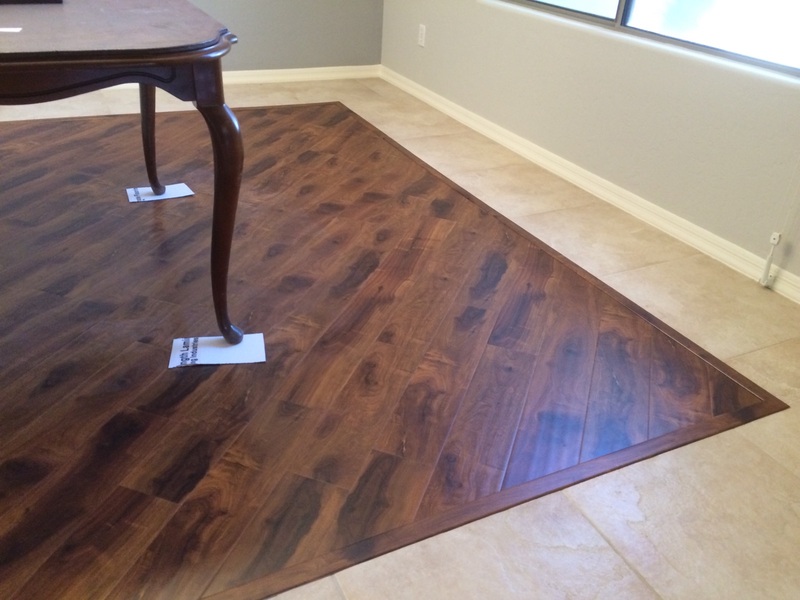 Mr. and Mrs. h in Goodyear Arizona came to our Peoria Showroom wanting to update their gorgeous west valley home by getting rid of some old carpet and tile and install a beautiful exotic laminate from the Gemwoods Scottsdale Collection. They chose Sunrise Walnut for a great exotic look! Laminate products have the same look as wood but hold up a bit better with pets, kids, high traffic etc… Its easy to clean and maintain and keeps a warm look. We did an office, a dining room and a master bedroom. The home owners along with our Peoria estimator came out with a cool idea in the dining room. A singe row of tile was left around the perimeter where our installation crew trimmed out the boarder with t-molds because it is a floating floor and laid the planks on a 45 degree angle to add an additional accent. As the carpet came out our installer noticed some large foundation cracks in the center of the room where to concrete also rose into a hump. We had to pour a fair amount of leveling compound and do some grinding to get this slab into tolerance so we could lay our floor. We had a great time visiting with the home owners during the installation. They let us know they shopped several different contractors and ended up choosing Arizona Hardwood Floor Supply because of our clean listing with the registrar of contractors and Better Business Bureau. Overall the end result turned out great! Pad down and installing. Pad is 0 VOC!